Lithium-air batteries are poised to become the next revolutionary replacement for currently used lithium-ion batteries that power electric vehicles, cell phones and computers. Lithium-air batteries, which currently are still in the experimental stages of development, can store 10 times more energy than lithium-ion batteries, and they are much lighter. That said, lithium-air batteries could be even more efficient and provide more charge with the incorporation of advanced catalysts made from two-dimensional materials. Catalysts help increase the rate of chemical reactions inside batteries, and depending on the type of material from which the catalyst is made, they can help significantly boost the ability of the battery to hold and provide energy. "We are going to need very high-energy density batteries to power new advanced technologies that are incorporated into phones, laptops and especially electric vehicles," said Amin Salehi-Khojin, associate professor of mechanical and industrial engineering in UIC's College of Engineering. Salehi-Khojin and his colleagues synthesized several 2D materials that can serve as catalysts. A number of their 2D materials, when incorporated into experimental lithium-air batteries as the catalyst, enabled the battery to hold up to 10 times more energy than lithium-air batteries containing traditional catalysts. Their findings are published in the journal Advanced Materials. "Currently, electric vehicles average about 100 miles per charge, but with the incorporation of 2D catalysts into lithium-air batteries, we could provide closer to 400 to 500 miles per charge, which would be a real game-changer," said Salehi-Khojin, who is also the corresponding author of the paper. "This would be a huge breakthrough in energy storage." Salehi-Khojin and his colleagues synthesized 15 different types of 2D transition metal dichalcogenides or TMDCs. TMDCs are unique compounds because they have high electronic conductivity and fast electron transfer that can be used to participate in reactions with other materials, such as the reactions that take place inside batteries during charging and discharging. 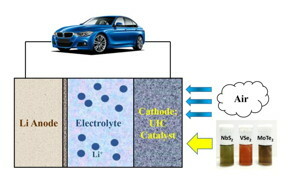 The investigators experimentally studied the performance of 15 TMDCs as catalysts in an electrochemical system mimicking a lithium-air battery. "In their 2D form, these TMDCs have much better electronic properties and greater reactive surface area to participate in electrochemical reactions within a battery while their structure remains stable," explained Leily Majidi, a graduate student in the UIC College of Engineering and first author of the paper. "Reaction rates are much higher with these materials compared to conventional catalysts used such as gold or platinum," Majidi said. One of the reasons the 2D TDMCs performed so well is because they help speed both charging and discharging reactions occurring in lithium-air batteries. "This would be what is known as bi-functionality of the catalyst," Salehi-Khojin said. The 2D materials also synergize with the electrolyte--the material through which ions move during charge and discharge. "The 2D TDMCs and the ionic liquid electrolyte that we used acts as a co-catalyst system that helps the electrons transfer faster, leading to faster charges and more efficient storage and discharge of energy." "These new materials represent a new avenue that can take batteries to the next level, we just need to develop ways to produce and tune them more efficiently and in larger scales," Salehi-Khojin said. Poya Yasaei, Zahra Hemmat, Pedram Abbasi, Shadi Fuladi, Xuan Hu, Robert Klie, Fatemeh Khalili-Araghi and Baharak Sayahpour of the University of Illinois at Chicago and Robert Warburton and Jeffrey Greeley of Purdue University are coauthors on the paper. This research was supported in part by the National Science Foundation DMREF Grant 1729420.